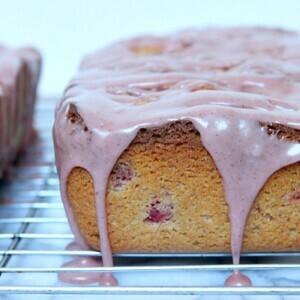 This Raspberry- Cinnamon Loaf Cake with Raspberry Glaze is a delicious cake made with love… for those you love. The busy holiday season is almost already in full-swing. In our house this year, family and friends will be abundant on both Thanksgiving and Christmas. That means I will have many mouths to feed, and I’m going to need to make sure that I have enough goodies around to satisfy everyone’s cravings. Berries are something I buy every single time I’m at the grocery store to have available for snacking and recipes. My berry-loving 12-year old appreciates that. His favorite berries of all time are RASPBERRIES! He’d eat a whole package in one sitting if I let him (which I’d take any day over processed food from the pantry). 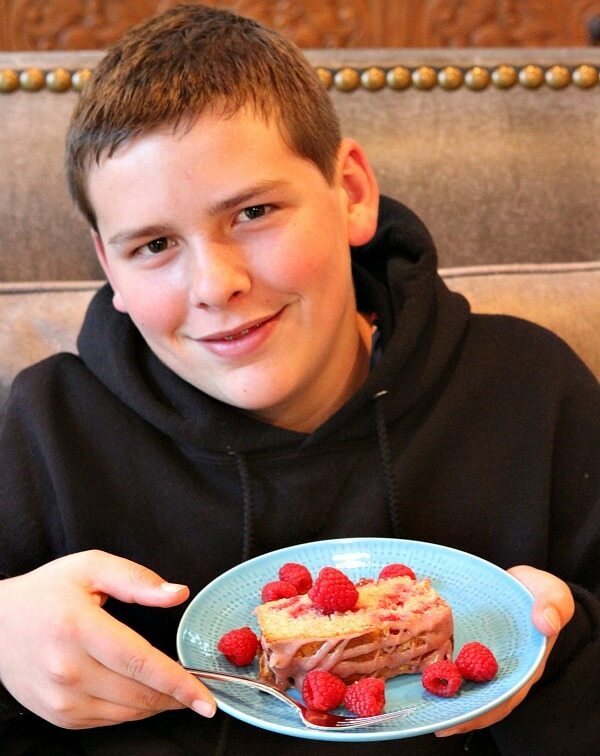 I made my not-so-little-anymore guy a special “raspberry themed” treat the other day: Raspberry- Cinnamon Loaf Cake with Raspberry Glaze. Here’s what you need to make the cake. 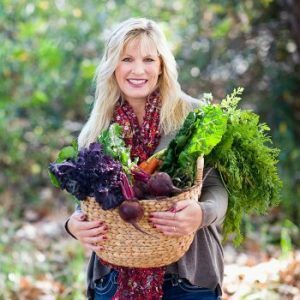 Everything you’ll likely find in your kitchen, and then pick up some plain Greek yogurt and Driscoll’s Raspberries at the store. 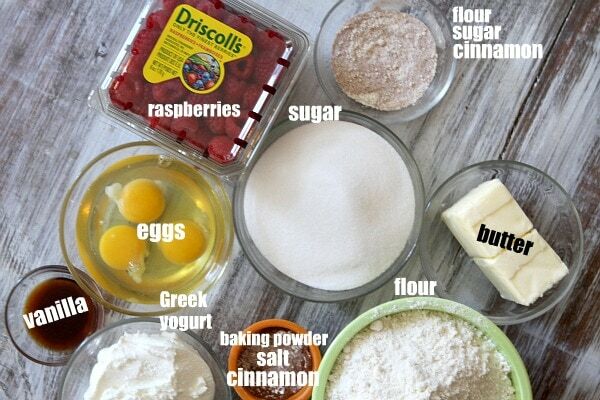 Flour/sugar/cinnamon coated raspberries are gently folded into the sweet cinnamony batter. The batter is divided between two loaf pans. I always like to add a little extra raspberry love on top. And with TWO loaves, you get to spread the love around. Keep one for your family, and wrap the second loaf to give to a friend, neighbor, teacher, or someone in need. Every good loaf cake needs a generous drizzle of sweet glaze (unless you prefer it without, of course). This one got a good dose of raspberry glaze. Drizzled back and forth and every which way. A perfect slice… made with love. In this day and age, we are thankful for the family and friends that surround us and GOOD HEALTH. When my son comes home from school, I make it a point to sit and eat a snack with him and ask him about his day. That family together time is so important- a tradition of sorts. We connect through food- whatever special treat I’ve put together that day. To get a 12-year old to talk- about anything- is a great feat indeed (but my secret strategy works very well). This day- he was over-the-moon about seeing raspberries and a cake devoted to them on his after-school snack plate. After chowing down on one piece, he sort-of-politely asked for another (middle school boys are HUNGRY). He has already requested that we make this Raspberry Cake again for our visiting relatives over the holidays. Next time, he said, I should add more raspberries to the cake. I’m definitely on board for that. 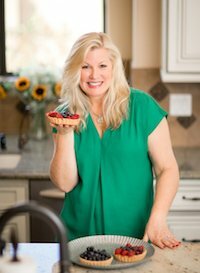 Be sure to enter the Made With Love Sweepstakes on the Driscoll’s Berries website– there will be 2 grand prize winners (KitchenAid Stand Mixer + Berries for a Year) and 4 second place winners (Berries for a Year!) Go enter for a chance to win, and GOOD LUCK! 1. 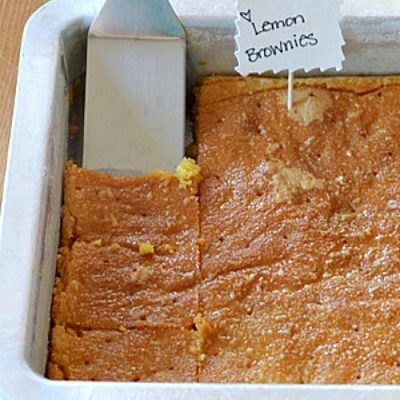 Make the cakes: Preheat the oven to 350 degrees F. Spray two 8x5-inch loaf pans with nonstick spray (I like to use Pam Baking Spray). 2. In a medium bowl, whisk together the flour, baking powder, cinnamon and salt. 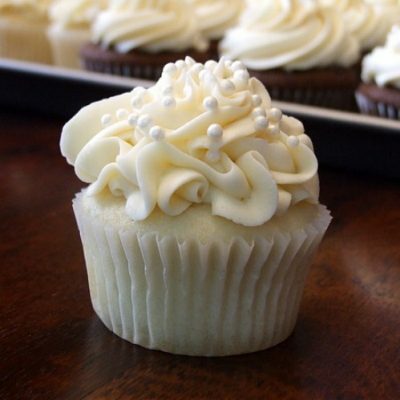 In a separate, larger bowl, use an electric mixer to combine the butter and sugar until light and fluffy. Add the eggs, vanilla and yogurt and continue to mix until well-combined. Add the dry ingredients and mix just until incorporated. 3. 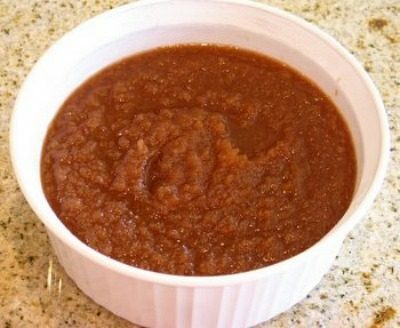 In a medium bowl, mix 1 tablespoon flour, 1 tablespoon sugar and 1 teaspoon cinnamon. Add the halved raspberries and toss to combine. Gently fold the coated raspberries into the batter. Divide the batter between the prepared pans and smooth the tops. Dot additional halved raspberries on top of each loaf, if desired. Bake for 1 hour, or until the loaves are golden brown and a toothpick inserted into the middle comes out clean. Let the loaves cool at least 20 minutes, then turn them onto a cooling rack to cool completely. 4. Make the glaze: In a medium bowl, use a whisk to combine powdered sugar with butter, water and vanilla until smooth. Whisk in the jam and cinnamon until well combined. Drizzle the glaze over the cakes and let sit until the glaze is set (or refrigerate to speed up the process). Loaves may be kept at room temperature to enjoy within 3 to 4 days, or they can be wrapped and frozen for later enjoyment. 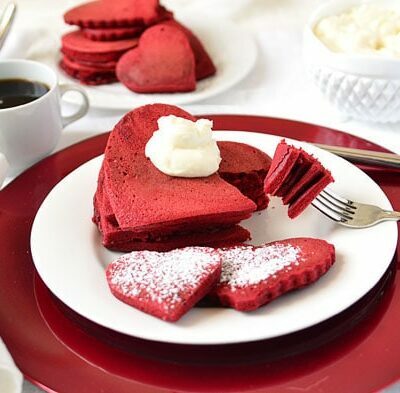 Disclosure: This “Made with Love” post was written in partnership with Driscoll’s Berries. Visit Driscolls.com for more information. All opinions shared are my own. Another amazing recipe by you. I made it for some company and they raved so much about it, that I sent them home with the second loaf. Just picked more raspberries and ready to make another batch. This is one of my top loaf recipes now, thank you. oh wow, thank you so much for letting me know! I’m glad you and company enjoyed it! 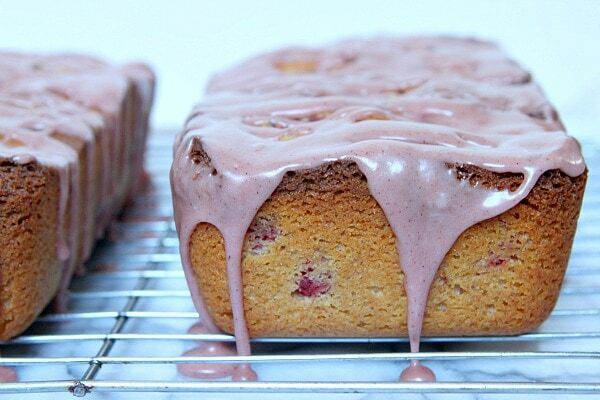 You`re tempting me to go out and buy a pint of raspberries, because this loaf cake looks so yummy! Lori, you are such a good Mom! Love the tradition you have with your Recipe Boy after school. And, I agree…raspberries ROCK. My favorite berry of all time. 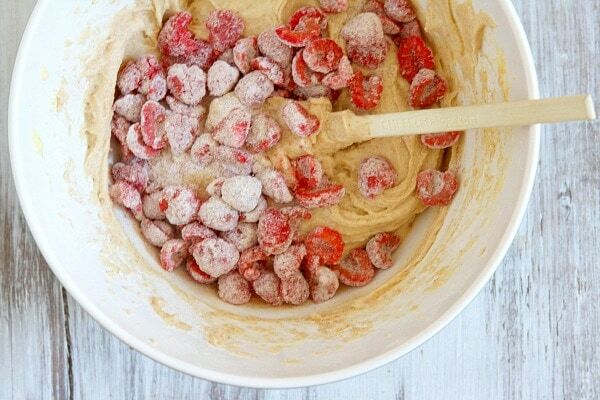 Love that you enhanced the cake batter with cinnamon. Terrific idea! Thanks for sharing! This looks too good to pass up! 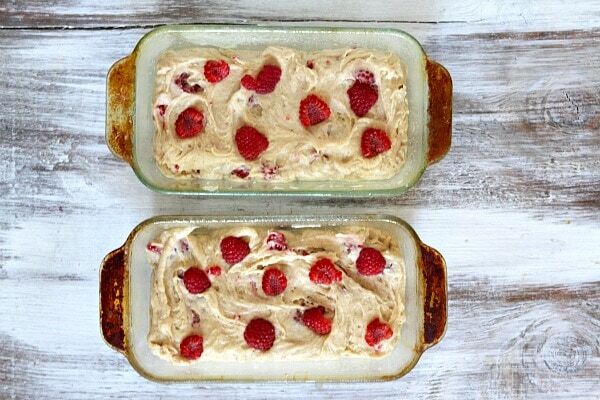 My oldest adores raspberries, so I know this would be a hit with him! BTW – your son looks so much like you! Love this cake! So pretty. What a lovely berry-full loaf!! Do you think you could use frozen raspberries in it? The fresh packs are just SO expensive here right now! Yes, I’m sure that would be just fine. You are the sweetest mom! I love that you sit with your son after school, what a nice tradition and perfect bonding time! This cake looks perfect and very festive for the holiday season! I am getting excited already! I love the pinkish frosting, it will be very holiday-ish. I buy a load of raspberries every time I’m at Costco and freeze. Great to have around for when inspiration hits. 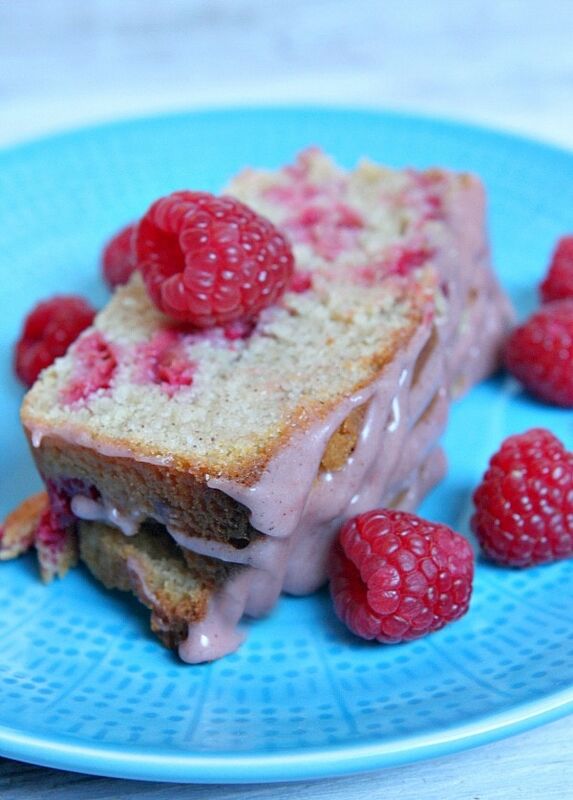 Driscoll Raspberries are a staple in our frig too – this cake looks amazing. Raspberries are my favorite too!!! Anything raspberry I will pick over other flavors. I’ve liked them all of my life. I remember going raspberry picking at my great aunt’s farm when I was nine years old. We kids were used to pick everything from sticky okra, rows and rows of tomatoes, to stalks and stalks of corn and the usual field peas and green beans. I loved the raspberry plants. They weren’t itchy and we could eat as we picked. I can tell you right now that my son would absolutely LOVE to go raspberry picking! I love that you sit with your son and talk with him while he has a snack afterschool. So important and so awesome 🙂 I do the same but it’s admittedly easier I’m sure at age 6 than at age 12. Beautiful cake and that glaze… so pretty! Keep the tradition going- it makes it easier when they get older as it’s old habit by then! Yum! This is beautiful, and it looks delicious, too. 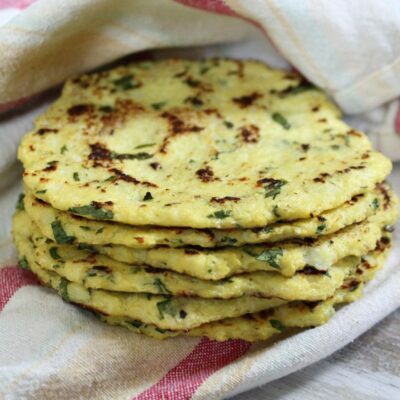 It would be the perfect addition to a holiday brunch spread! I know I would love this!. 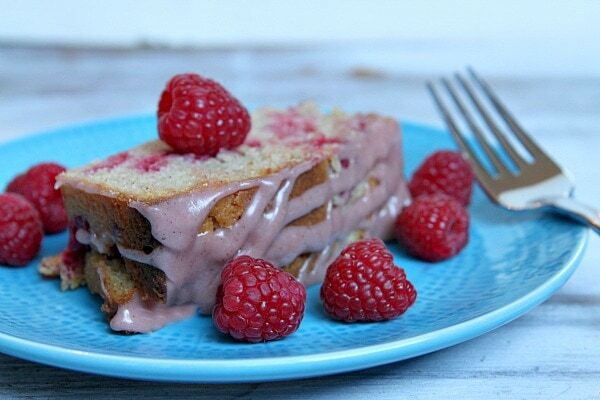 It can’t get much better than raspberries and cinnamon baked in a loaf cake and topped with that sauce. Yum! 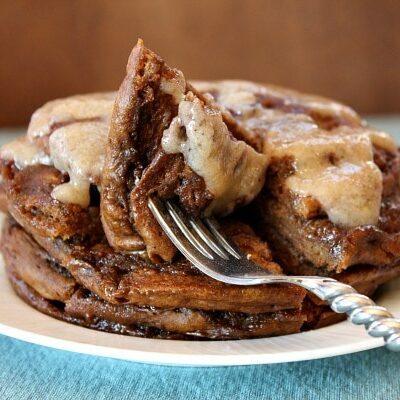 This looks just absolutely delish!!! 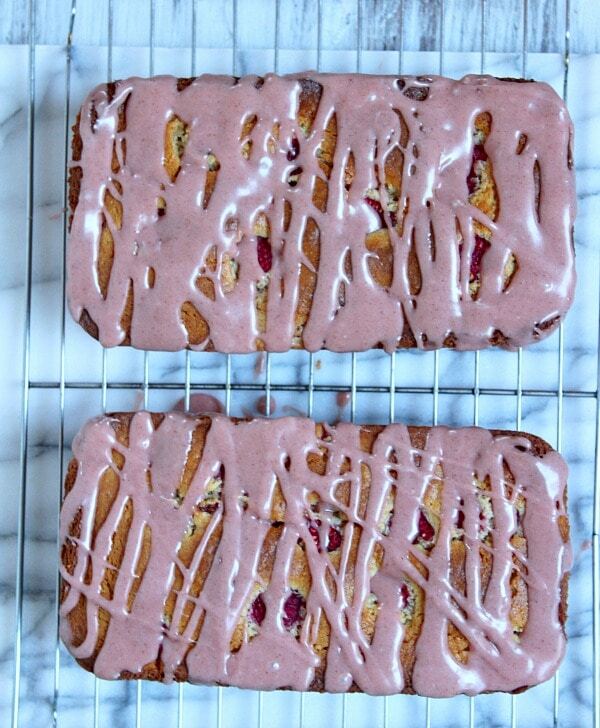 All these raspberry recipes are killing me! I just love them–my favorite fruit ever. And this cake is gorgeous, especially with the raspberry jam glaze drizzle on top. Yum, this recipe looks absolutely wonderful! I’m sure it tastes just as good as it looks, too! Also, I love the after-school snack tradition you have with your son, it reminds me of what my mom used to do for me, when I came home from school, years ago. It leaves me with many fond memories!